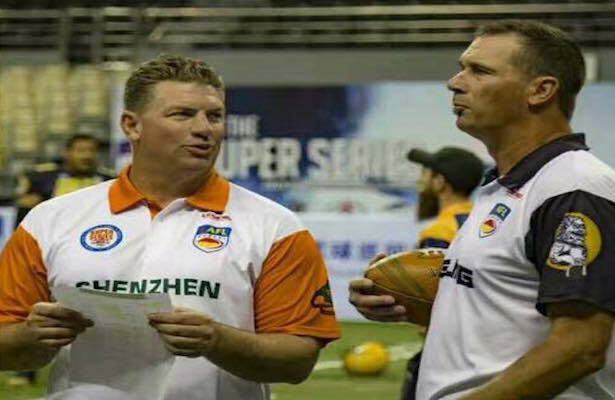 The China Arena Football League is a league of firsts. Today the first ever match up of undefeated teams took place as the Shenzhen Naja met the Beijing Lions as each team entered 1-0. This game lived up to the hype as a Luke Collis touchdown pass to Erwin Sennett Wu on the Lions last possession enabled them to escape the Damai Center with a 48-41 win over Shenzhen. The Shenzhen offense which is predicated on the run came out throwing to start the game. The first completed pass by Dak Britt to Xinhe Xu went for 30 yards but Beijing’s Torez Jones forced a fumble and the recovery by James Romain led to the Lions first score. The teams traded touchdowns before Jones intercepted a Britt pass in the second quarter. Beijing quarterback Luke Collis capitalized on the turnover tossing a six yard pass to tight end Neal Tivis to run the score to 28 to 15. An interception by James Romain closed out the half and it appeared that the Lions would carry the momentum. That good feeling was short lived as Terrance Smith intercepted Collis on the first play of the second half and it was clear the Naja was not backing down. Four plays later Dak Britt, who ran for 95 yards on 13 carries, was into the end zone and Shenzhen trailed by seven. The teams traded scores with Beijing’s Rustin Mayorga cashing in on a three yard run, but a failed on-side kick enable the Naja to close to within six points as Britt netted his third rushing TD of the game. Beijing ended the third quarter as Erwin Sennett Wu hauled in a 21 yard strike from Collis and the score read 41-28 Lions. 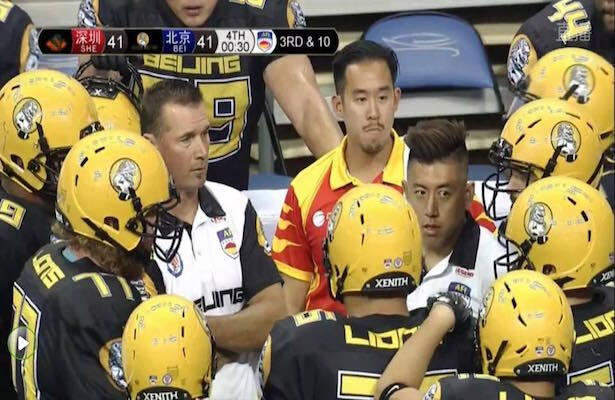 Beijing Lions Coach Clint Dolezel goes over play strategy with his team. In the final frame Britt connect with Xu for his first career TD and the Naja trailed by 6. The Shenzhen defense got the football back after David Hong’s sack got the Lions off schedule, handing the football over on downs. It only took the Naja seven plays to tie the game as Britt connected with Shida Wang for his second score of the contest. Beijing answered with a four play drive with Collis connecting with Wu for his second score of the night and the 47-41 final.